This is one of those articles where they happen to get it exactly right. How many people alive today have ever even seen a mechanical television? The CRT is probably one of the more important inventions of the last century. It made TV and computer displays practical and economical. It was even used for data storage. Kids growing up today will never learn the joy and muscular-skeletal pain one received simply by attempting to lift a 30″ TV on to a table. Television receivers of tomorrow will employ this newest scanning device, which “paints” the image on a fluorescent screen with a beam of electrons moving at incredible speed. THE Cathode-Ray Tube gives every promise of becoming the real panacea for all of television’s problems. There are strong rumors that one of the largest television and radio interests will, probably, place on the market this season a television receiver for home entertainment, in which a specially designed cathode-ray tube will do the scanning, and take the place of the now familiar revolving scanning disc and motor. The cathode-ray tube has several notable advantages over the mechanical scanners; one of which is that it eliminates all rotating or other moving mechanical parts. The image is “painted” on a fluorescent (chemically-reactive) screen on the inside of the large end of the tube. The beam of electrons constituting the cathode ray, and which is caused to move back and forth, as well as up and down, in order to scan the screen and build up the image, moves with practically no inertia or lag. This means that the cathode ray can be caused to oscillate or scan at any desired speed, even up to a million times or more per second! The cathode ray can be caused to move or be deflected by producing either electrostatic charges or magnetic fields in close proximity to the cathode ray. Thus, the scientists have found that by placing two sets of small electrodes inside the tube, at right angles to each other, as shown in the pictures, and by applying oscillating currents of certain definite frequencies to each pair of plates, the cath- ode ray may be caused to scan back and forth at say 1200 times per second, and up and down at the rate of 20 times per second. With this, it is possible to reconstruct a television image for us, as now broadcast from television stations. One New York City genius has built up suitable neon tube oscillators, which provide oscillating currents of the required frequency, so that the cathode ray (which is invisible in itself, but creates a bright spot wherever it strikes the fluorescent screen) is caused to move back and forth, and up and down, as explained previously. The strength of the cathode ray is continuously modulated or varied by the incoming television signals from the transmitting station. As the cathode ray varies in strength, so likewise does the luminous path on the fluorescent screen vary in brightness; and so the lights and shadows of the television image are built up. The accompanying diagrams, showing how a face, for example, is scanned in “paths” or lines, one after the other, will help to make clear just how the image is built up on the end of the cathode ray. Secondly, we have to keep in mind the fact that this “back and forth” movement of the cathode ray as well as its progressive vertical oscillating motion, is performed so quickly that the human eye sees only the “finished image” or picture. It is possible also to regulate the frequency of the oscillators supplying the control currents, so that the scanning hands or paths may slightly overlap and thus produce a very smooth-appearing image. The reason why the “saw-tooth” waveform is required in the oscillator control currents, applied to the two pair of plates inside the tube, is that the cathode ray must be carried across to “paint” its path on the fluorescent screen; it must then return instantly to its starting point to “paint” the next scanning path. In other words, if the cathode ray took 1000th of a second to move across one scanning path, it should only require one ten-thousandth of a second, for example, to return to its starting point and begin scanning across the second path, and so on. Numerous articles on cathode ray tubes for television scanning which every student of television should read, have appeared in past issues of Television News; notably the July-August 1931 issue and the November-December 1931 issue. Unless my math is worse than I suspect, the 1200 scans per second horizontally and 20 scans vertically describes a 60 line image, comparable to the mechanical systems. I suppose it was describing it in terms the experimenters were familiar with. They could have mentioned it would make 400 Line images possible. This seems like a very interesting issue your going thru right now; I love the articles. No mention in this one of the camera that was to be used; IIRC, before the iconoscope was “released to the public” (in 1933) or in wide use, the idea was going to be to use a powerful version of the cathode-ray tube (and similar sensitive optical pickups) to scan the scene much like the “flying-spot” mechanical scanners. Thus, there would be higher-speed scanning than could be done mechanically, plus higher resolution. 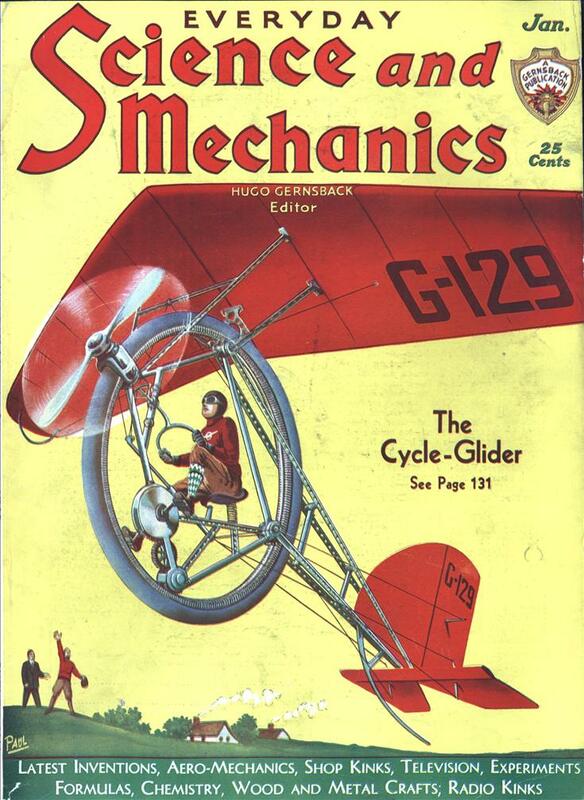 Of course, once the iconoscope and similar camera tubes became available, mechanical TV rapidly went out of fashion. It is true that unless there were an electronically-scanned tube for the camera, as long as the camera was mechanical, using a cathode ray tube in the receiver would not have permitted huge increases in resolution. And, IIRC, some early experimental broadcasts involved 120 lines or 150 lines, I think: too many for a disk system, but much less than eventually used in the modern electronic systems, even the British 405-line black and white system. Still, the article certainly was correct that this was the future of television. Also, while the iconoscope wouldn’t be revealed until the next year, and it was the first practical electronic camera tube, the image dissector had already been patented in Germany in 1927, so the idea that camera tubes could be electronic was not unknown when this article was written. This definitely was the future technology for TV in the 30’s. This article proposed a 20 frame per second progressive scan. At a horizontal scan rate of only 1200 Hz (cps in 30’s terms) In today’s television terms, this would be 60p video. On a small 3 inch screen that may be acceptable. RCA, in 1939, introduced “high definition” television with a 60 Hz vertical scan rate and a 15750 Hz horizontal rate. This is the same specs of Standard Definition today. They also introduced interlaced scanning where the odd lines are scanned and then the even lines are scanned. This reduced flicker and lowered the Horizontal scanning rate to achieve what is today 480i. (22 1/2 lines are used in each scan field for vertical blanking) The whole physical nature of scanning the screen went away with digital displays. BTW DLP uses a spinning COLOR wheel not an APERTURE disk. This is akin to the CBS method for color TV in the early 50’s. The DLP chip uses microscopic mirror elements for each pixel. They each pivot to deflect light. The chip is inherently monochromatic. It is then synchronized with a rotating color wheel. That is why you get a rainbow effect on fast moving objects. Sorry Andrew, I misread your comment. Yes, the DLP chip is electromechanical. I thought you were referring to the color wheel that is used on most projectors. Interestingly, much later I became a trainer for Pioneer Electronics at exactly the same time as the first industrial flat-panel plasma displays were hitting the market. I was literally in the best seat in the house to watch CRT devices dwindle away. No mention of Philo Farnsworth the inventor of electronic television. in additon to variations in brightness! When did the “Horizontal Hold” and “Vertical Hold” knobs dissappear? I remember a Columbia TV we had that had them front and center, and almost as big as the others (volume/tone and channel/fine-tuning) The next one we had hid them behind a door, then the next had them on the back of the set. Was it in the 1980s that they finally disappeared? Vertical and horizontal hold controls on the old TVs were fine frequency controls for the Horizontal and vertical sweep oscillators. As electronic circuits got more sophisticated, they were able to clamp onto the sync pulses of the video signal much better. The vertical hold control lingered a little longer due to the fact that the vertical sync is more complex with interlaced scanning. With the advent of ICs and digital circuitry, the knobs went away. When you think of it, volume and channel KNOBS went away too. 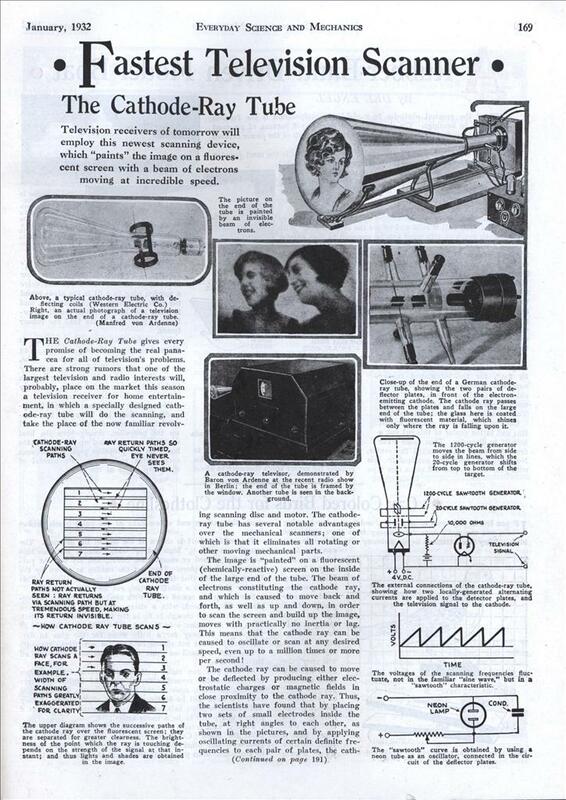 Check out MY magazine scans about early televison experiments in 1938. By that time it was all electronic. Two years earlier the BBC already had television. Check the YouTube for ‘Television comes to London’.